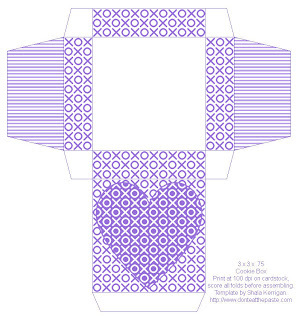 A set of cookie boxes with a simple hugs and kisses design. I hope you like them! Click on the images for the full sized versions. 100 dpi on cardstock. Mmmm...coookies.... Thanks so much! I'll be linking. I love your boxes. How generous you are to share your talent and creativity! I just found you through One Pretty thing - and I WILL be back! Absolutely. I hope the cookie sales go well for you! Book Reviews- two books I like for my teens.